In almost all industries fans play a leading role in conveying combustion air or gases to or from the process. It is not uncommon that they are a critical item in the system. Having a critical component go down unexpectedly is not an option. 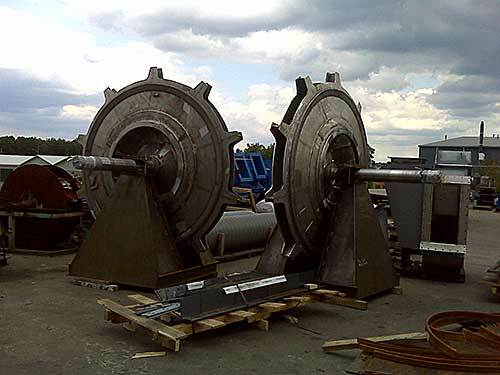 However with the demanding applications often present in Cement Plants Steel Mills or Refineries can lead to fan failures due to stresses caused by abrasion, corrosion or metal fatigue. Our fans are designed using the latest in modelling software technologies ensuring low stress levels and optimizing material use. Natural frequencies are well removed from operating speeds. Sensitive frequencies such as a 2 times and blade pass are also mitigated. Utilizing Bump test procedures further ensures a stable and reliable wheel. Resizing impeller width and diameter for actual operating conditions versus original (overdesign) design. Canadian Buffalo will recommend improvements to the fan assembly or its components, in order to allow you to increase your throughput or extend the life of your fan components. 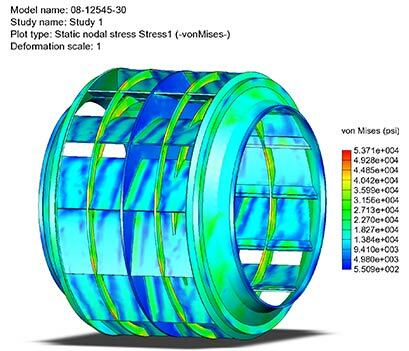 To accomplish this we use Critical Speed Analysis, Finite Element Analysis, 3D Modelling and Fatigue Analysis. If you have any questions regarding any of these services, don’t hesistate to contact us.